Optex, the leading detector manufacturer, has added to its range of reliable perimeter detection technologies with the launch of the Fiber SenSys® FD322 – an affordable, high performance fibre optic fence detector system for challenging outdoor environments. Ideally suited to large industrial, retail and commercial premises where reliability is key, the advanced fibre-optic sensing is unaffected by harsh external conditions including UV radiation, moisture, salt, or even lightning strikes. Harnessing the latest fibre optic technology – and mounted on fences to cover up to 500m for each of its two zones – the FD322 uses sophisticated algorithms to detect intruders who are attempting to climb over, crawl under, or cut through a perimeter line. These same algorithms are also able to distinguish between genuine intruders and nuisance alarms that might be caused by wind or small animals. Nigel Hackett, Sales Director at Optex Europe, says that the addition of the Fiber SenSys FD322 detectors to the Optex range provides end-users with incomparable choice and at a very competitive price: “It brings a new level of perimeter security to mainstream industrial and commercial sites where such technologies have previously proven too costly,” he says. 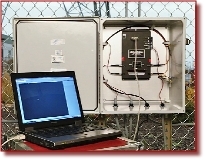 The high-end models within the Fiber SenSys range have been approved by the US Air Force and are the only fiber-optic intrusion detection system that is Priority Level 1 Nuclear Approved, and is ideally suited for large government and critical infrastructure applications, including military (permanent and tactical), airports, government facilities, prisons, nuclear and chemical plants, refineries, heritage properties, power stations and reservoirs.